The U.S. Capitol Christmas Tree at the U.S. Capitol. 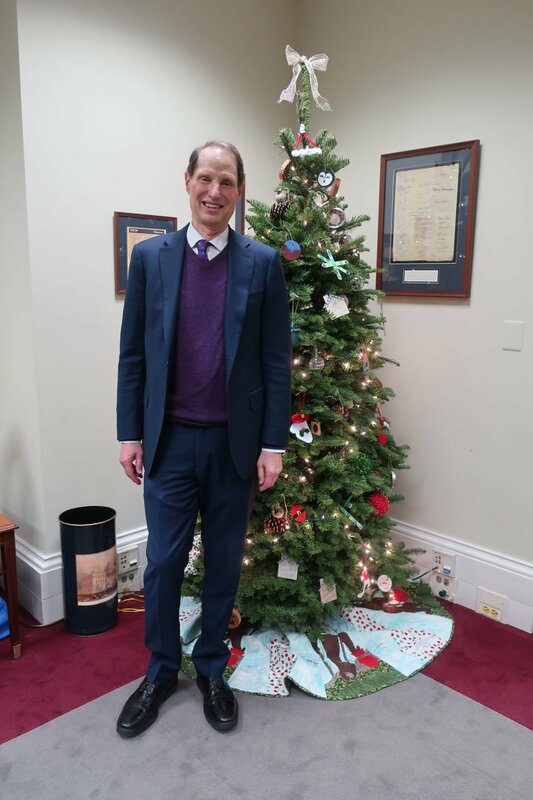 Sen. Ron Wyden has his companion Christmas tree, which was delivered by the Willamette National Forest's Capitol Christmas Tree group to his Washington, D.C. office. Rep. Greg Walden stands at the companion Christmas tree delivered to his Washington, D.C. office by the Willamette National Forest's Capitol Christmas Tree group. WASHINGTON, D.C. — It's the most beautiful Capitol Christmas Tree ever. Sure, there was an element of partiality involved, but a series of speakers at Thursday's Capitol Christmas Tree ceremony were unanimous in agreeing the 82-foot tall noble fir is the most beautiful to light up Capitol Hill's west lawn. While some speakers at the lighting ceremonies had a personal bias — including Oregon Sens. Ron Wyden and Jeff Merkley and Rep. Peter DeFazio, whose Fourth congressional district includes Sweet Home, where the tree is from. Outgoing Speaker of the House Paul Ryan of Wisconsin joined the chorus in praising what's known as "The People's Tree." "What about this tree, this beautiful tree," Ryan said before it was lighted. "I've got to say this noble fir is the best I've ever seen. It is a gorgeous tree." "Isn't this the most beautiful People's Tree in the history of the United States of America?" echoed Merkley. "I've never seen one so extraordinarily symmetrical." "I always have nobles at home," said DeFazio. "And I'm pleased that someone had the good judgment to choose a noble." Noting the tree is only 35 years old, he bragged, "We grow them quick and big in Oregon." DeFazio also referenced this year's theme, "Find Your Trail," because 2018 marks the 50th anniversary of the creation of the National Trail system and 175th anniversary of the Oregon Trail. He noted the act creating the system came during a time of turmoil, the Vietnam War, noting then as now, "This tree allows everyone to come together." Referencing then President Lyndon B. Johnson, DeFazio said the trees, trails and national forests preserve places where "beauty belongs to all people. And this is beauty." Wyden, wearing an Oregon Duck baseball cap, said the holidays reflect the celebration of Christmas, Hanukkah and other religions, gently insisting, "our diversity is our strength. ... What you're seeing is vintage Oregon." Referring to the year-plus-long process involved in selecting the tree, its 3,000-plus mile journey to Washington and the 30 celebrations in small and large communities along the Oregon Trail route, Wyden added, "This is Oregon at its best." Before lighting the tree, Ryan was joined by 9-year-old Bridgette Harrington of Hillsboro, Ore., a fourth-grader whose poem, "A Visit From St. Nicholas," was selected by Oregon Gov. Kate Brown as the best of more than 1,200 entries. Her reward was a trip to D.C. with her parents, Scott and Kim Harrington, to light the tree. During the week before the lighting, the precocious Harrington met members of Congress, played her violin and sang during a gathering at the National Press Club, met the keyboardist for the Rolling Stones touring band and Agriculture Secretary Sonny Perdue, visited the Capitol Rotunda to see the casket of former President George H.W. Bush, and generally stole hearts of audiences with her poise, smile and skills. A reception at the U.S. Botanic Garden featuring Oregon cuisine, wines, beer and spirits, was held following the tree lighting. The beautiful tree is decorated with several thousand of the more than 10,000 ornaments handmade by Oregonians. Others are on smaller companion trees in the offices of Forest Service and other federal agencies and many members of Congress. It will remain lighted on the Capitol's west lawn through New Year's.